Spending time outdoors is a natural pastime in sunny California, and retractable awning options from Sunesta can help you make the most of it by creating shade when you want it for your patio, pergola, or pool deck. Just think: You can host a pool party where your guests can lounge in shady comfort and nibble from poolside snack tables that are protected from the elements under your Sunesta Retractable Awning. Then, if your guests linger into the evening hours, you can retract the shade and let them enjoy the cool breeze and starry skies of a beautiful night in California. And that’s only one way a retractable awning can enhance your enjoyment of your home. You can also use retractable canopies over windows and glass-pane doors to control the amount of sunlight that enters your home. In the summer, for example, extending your shade to block the sun during the hot part of the day will help you cut your dependence on air conditioning for comfortable indoor temperatures, while in the winter, retracting the awning in the afternoon will reduce your need for heating. Thus, a retractable awning can help you conserve natural resources and save money on your energy bills at the same time. 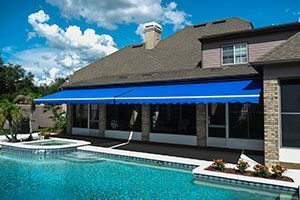 Quality and selection – Our awnings are made of synthetic, fade-resistant fabric that comes in more than 150 colors and patterns, so you’re sure to find a look that complements your home. Exceptional warranty coverage – All parts of our awnings are protected by some of the best warranties in the industry, which gives you confidence in your investment. Customer service – We offer a speedy turnaround from order to delivery, and we keep up with every customer’s order details through our exclusive SmartCode‚Ñ¢ system, which allows us to continue customizing your service after the sale. To learn more about how a custom retractable awning can add style and shade on demand to your home in California, contact Sunesta today.